Canadian corporate aircraft manufacturer Bombardier, Inc. recently announced that they have been testing and preparing for certification three brand new corporate jets. These new jets will be added to their portfolio of numerous other jets that are designed to be used by today’s corporate executives and other end-clientele. The Bombardier Global 5500, 6500 & 7500 each offer high-class amenities and travel over long distances. Today’s business environment involves more and more global travel as companies expand all around the globe. The needs of business executives to get meetings on the other side of the globe with short notice makes it necessary for them to have ready access to an aircraft. Bombardier, Inc of Canada, is one of the leading manufacturers of corporate level private jets in the world and is the primary competition to Gulfstream Aerospace, an American company. Each model or class of aircraft is usually categorized by its capabilities and it generally revolves around the distance of travel, which is frequently listed in nm or nautical miles. The Bombardier Global line of corporate jets consists of the Global 5500, 6500 and 7500 all feature two brand new Rolls-Royce Pearl jet engines that are designed especially for the Bombardier jets. When it comes to corporate jets they are categorized typically by the distance that they are able to cover in the air. 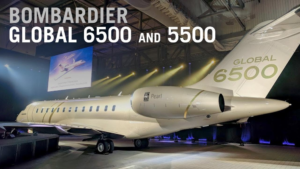 The Global 5500 is able to fly distances of 5700 nautical miles, 6500 can travel a distance of 6600 nautical miles and the 7500 will cover as much as 7500 miles. In order to facilitate the additional distances that are being claimed by Bombardier, it was necessary for them to make serious wing-configuration changes in order to be able to extend the distance capabilities of each of the three models of corporate jets. The interior design of each of the planes will depend on a number of different factors and can be quite extravagant. The seating capacity and layout can also be customized to fit your specific needs. If your business is looking for a new corporate jet in order to get employees from point “A” to point “B” and do it in extreme style, then you really need to look into what Bombardier, Inc. has to offer, including their latest models Global 5500, 6500 and 7500. For more information on Bombardier, be sure to click here. Or, navigate here for more info on how to buy a private jet.